SAN DIEGO (KGTV) -- Rainy days like these are not ideal for downtown bartenders like Brittany Devine. She works at the Knotty Barrel on Market Street, relying on tips to help make the rent. “It’s a lot slower than in the summer, when we have baseball games and conventions,” said Devine. She pays $800 to split an apartment in North Park. “I feel like I’m saving all of my money for the first and then all of my money gets swiped for rent." Devine among thousands of San Diegans competing for the region’s low supply of homes. The average rent in the county is now about $1,900 a month, according to Marketpointe Realty Advisors. One of the big challenges is that people keep moving to San Diego for jobs, but there aren’t enough homes being built to accommodate them. The state reports that employers have added 26,000 payroll positions in the last year, but developers have only pulled permits for about 11,500 new housing units. 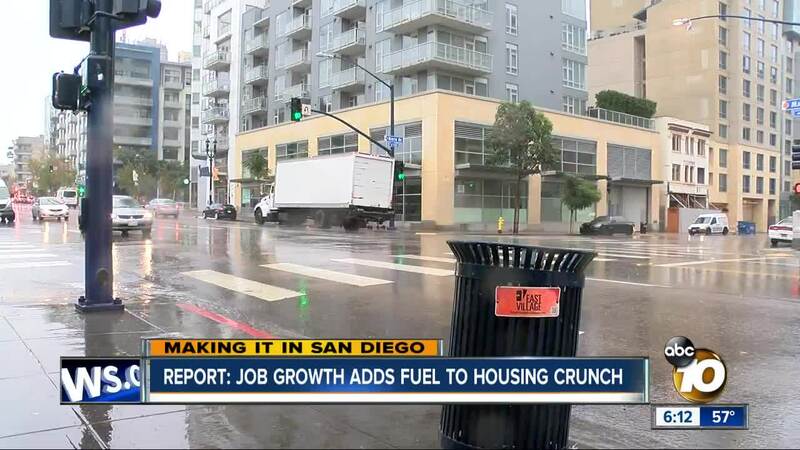 “You can’t have population growth and one half of the units that are needed to house these people,” said Borre Winckel, who heads the San Diego County Building Industry Association. The BIA’s new report says San Diego County homes are nearly 60 percent more expensive than the national average. “Developers and builders can’t respond to the demand because the cost to construct the new units exceeds the pocketbook of the folks who need these houses the most,” Winckel said, adding labor costs and regulations are the two biggest challenges. Meanwhile, new laws continue to be developed - one, taking effect Jan. 1, streamlines more affordable developments near transit centers.